12 CEMENT AMERICAS • Fall 2018 • www.cementamericas.com CEMENTSCOPE and organized real estate developers to state governments and construction majors. In recent years, the company has implemented various measures to ensure the reduction of CO2 emissions and energy conservation. 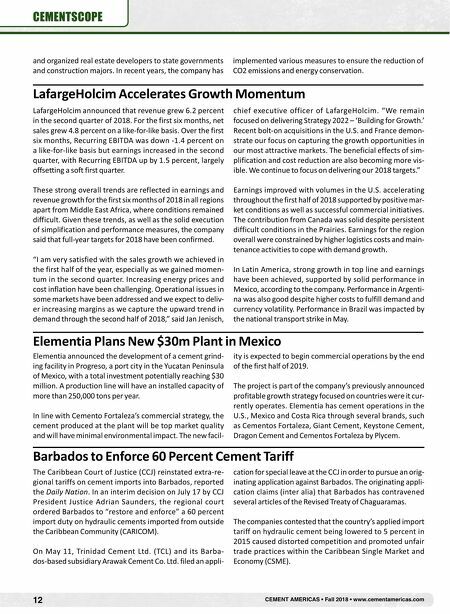 LafargeHolcim Accelerates Growth Momentum LafargeHolcim announced that revenue grew 6.2 percent in the second quarter of 2018. For the first six months, net sales grew 4.8 percent on a like-for-like basis. Over the first six months, Recurring EBITDA was down -1.4 percent on a like-for-like basis but earnings increased in the second quarter, with Recurring EBITDA up by 1.5 percent, largely offsetting a soft first quarter. These strong overall trends are reflected in earnings and revenue growth for the first six months of 2018 in all regions apart from Middle East Africa, where conditions remained difficult. Given these trends, as well as the solid execution of simplification and performance measures, the company said that full-year targets for 2018 have been confirmed. "I am very satisfied with the sales growth we achieved in the first half of the year, especially as we gained momen- tum in the second quarter. Increasing energy prices and cost inflation have been challenging. 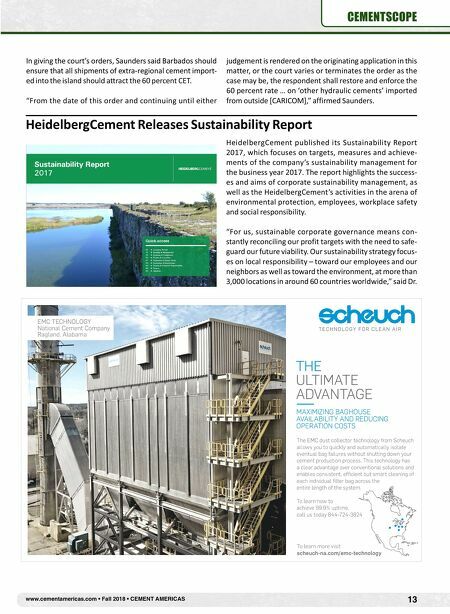 Operational issues in some markets have been addressed and we expect to deliv- er increasing margins as we capture the upward trend in demand through the second half of 2018," said Jan Jenisch, chief executive officer of LafargeHolcim. "We remain focused on delivering Strategy 2022 – 'Building for Growth.' Recent bolt-on acquisitions in the U.S. and France demon- strate our focus on capturing the growth opportunities in our most attractive markets. The beneficial effects of sim- plification and cost reduction are also becoming more vis- ible. We continue to focus on delivering our 2018 targets." Earnings improved with volumes in the U.S. accelerating throughout the first half of 2018 supported by positive mar- ket conditions as well as successful commercial initiatives. The contribution from Canada was solid despite persistent difficult conditions in the Prairies. Earnings for the region overall were constrained by higher logistics costs and main- tenance activities to cope with demand growth. In Latin America, strong growth in top line and earnings have been achieved, supported by solid performance in Mexico, according to the company. Performance in Argenti- na was also good despite higher costs to fulfill demand and currency volatility. Performance in Brazil was impacted by the national transport strike in May. Elementia Plans New $30m Plant in Mexico Elementia announced the development of a cement grind- ing facility in Progreso, a port city in the Yucatan Peninsula of Mexico, with a total investment potentially reaching $30 million. A production line will have an installed capacity of more than 250,000 tons per year. In line with Cemento Fortaleza's commercial strategy, the cement produced at the plant will be top market quality and will have minimal environmental impact. The new facil- ity is expected to begin commercial operations by the end of the first half of 2019. The project is part of the company's previously announced profitable growth strategy focused on countries were it cur- rently operates. Elementia has cement operations in the U.S., Mexico and Costa Rica through several brands, such as Cementos Fortaleza, Giant Cement, Keystone Cement, Dragon Cement and Cementos Fortaleza by Plycem. Barbados to Enforce 60 Percent Cement Tariff The Caribbean Court of Justice (CCJ) reinstated extra-re- gional tariffs on cement imports into Barbados, reported the Daily Nation. In an interim decision on July 17 by CCJ President Justice Adrian Saunders, the regional court ordered Barbados to "restore and enforce" a 60 percent import duty on hydraulic cements imported from outside the Caribbean Community (CARICOM). On May 11, Trinidad Cement Ltd. (TCL) and its Barba- dos-based subsidiary Arawak Cement Co. Ltd. filed an appli- cation for special leave at the CCJ in order to pursue an orig- inating application against Barbados. The originating appli- cation claims (inter alia) that Barbados has contravened several articles of the Revised Treaty of Chaguaramas. The companies contested that the country's applied import tariff on hydraulic cement being lowered to 5 percent in 2015 caused distorted competition and promoted unfair trade practices within the Caribbean Single Market and Economy (CSME).